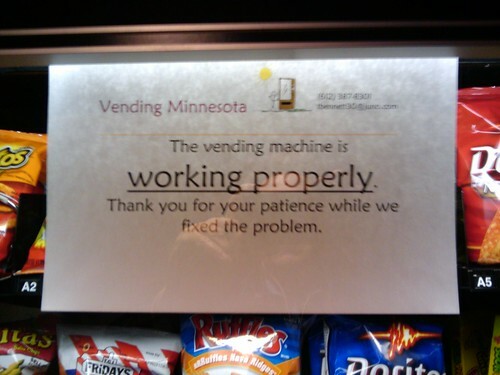 This sign is attached to a vending machine I used to use. Past is the operative tense here. I no longer use this particular machine because it has done such an effective job of branding itself. First, I lost a buck in it. Annoying, but there’s a number on the machine to call if you have any problems so at least they’ve got an avenue for customer service. But, you know, it’s a bit of a bother and it’s only a buck. Then, a couple weeks later, I tried again and again a I lose a dollar. Now I’m very annoyed and actually take the number down with plans of calling but I never actually do call them. It is, after all, only a buck. Still later, in a hurry and needing a bite on the go and somewhat reassured by the sign telling me that machine is now functioning properly, I try to buy some chips and again I lose a buck. Now, as you can imagine, I’m rather pissed off. It’s only a few bucks but still, it’s a few bucks it stole from me. Three times is a charm, as it were. That vending machine has successfully and permanently branded itself with me…as untrustworthy. I will no longer use it because it has fooled me too many times. No signs will change my mind. The only thing that could change my mind, I think, is if I saw them wheel the thing out and replace it with a new vending machine. Or, maybe, if it spontaneously and randomly offered me a pizza. Contrast my untrustworthy vending machine with Coke’s (a company my employer Tunheim does work for) Happiness Machine. I’ve been fairly vocal in my opinion that you cannot create viral content; things go viral because they are genuine, not deliberately manipulative, and that they tap into something in the culture. Matt Harding‘s dancing guy video, for example, came at a time when the world was fatigued by seven years of global crisis filled with terrorism, war, and fear and provided the world with a dose of global joy and hope. But what, then, about Coca-Cola’s Happiness Machine video, a deliberate attempt to create viral content? Uploaded in January, to date the video boasts nearly 1.8 million views. The reason the Happiness Machine went viral was that it was not staged in the sense that actors are scripted and staged. The vending machine provided the platform and the premise, but the action, the content, the story was provided by ordinary folks reacting to an extraordinary situation. The content was about them, not Coke. Because they got the human component of the video right, they are successfully rebranding the vending machines that dispense their products as Happiness Machines because anyone who has seen the video will likely think of it whenever they buy a Coke from a machine. Found at YouTube from cocacola.